My review format is going to be a little different on this one because it is a daily devotional. It is 365 one-page devotions to be read each day of the year. They are all fairly short easy reads, spanning a wide array of topics. The book was published in 1935 and was based on King James version of the Bible, but there are many options to purchase the devotional with updated language. My edition was edited by James Riemann, who has edited a number of older devotionals. You can find the book in old hardback, or newer paperback for as little as $5 most places, but I purchased the one pictured above, which will cost you about $20, because I’m a sucker for patent leather books. I’ve read a number of year long daily devotionals, but I think I have to put this as number one. Which makes my more expensive purchase seem like a good choice, as I will probably come back to this every few years or so. As is typical for daily devotionals, you have all or part of one verse, then a brief mini-sermon that can sometimes be something like a commentary on the selected verse or it will be something a little more practical. Often, Chambers has a point he wants to get across, and the selected verse acts more as a proof text. Most of the verses come from the New Testament, and are concentrated mostly around the Gospels. I think the pastoral nature of this devotional is what makes it so great. 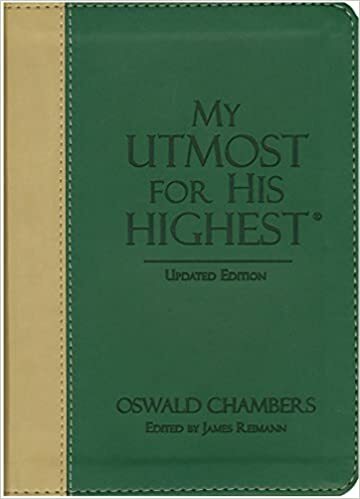 His style of writing, and the points he makes or doctrines discussed read less like they are preached from the pulpit and more like they are being spoken from the pastor directly to you. I’m a big fan of daily devotionals as it is, because they are a great way to focus your mind before you start your day. Most cane be read in less than five minutes. I read them in the morning, even Spurgeon’s Evening by Evening , after I get dressed before I head out to start my day. The strength of this book is the constant reminder of your need for Christ, what He has done for you, and how that should effect your daily life; what we should do in response to what He has done. That daily reminder of practical Christian living is what makes this devotional a must read. I like having a book to hold and read, but if you want a digital option, you can actually sign up to receive the content via email from Utmost.org.